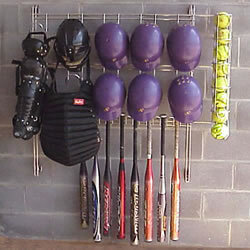 Keep dugouts organized with this durable steel rack that is easily attached to cement, brick or wood dugout walls. 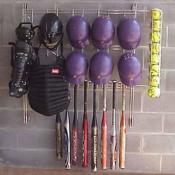 Holds up to 10 batting helmets with face guards, 12 bats & includes a ball chute for 10 baseballs or 8 softballs. Dimensions: 48 1/4" W x 39" H.
Note: This item has an additional shipping fee of $50.00 due to size and weight.